This is a guest blog post for Octopart and first appeared on their blog. Kitnic.it is a site to share electronics projects. If a project is on Kitnic, you can download the Gerbers and put parts into a retailer shopping cart with a single click. These are early days for Kitnic: our submission process currently involves opening a pull-request on GitHub. 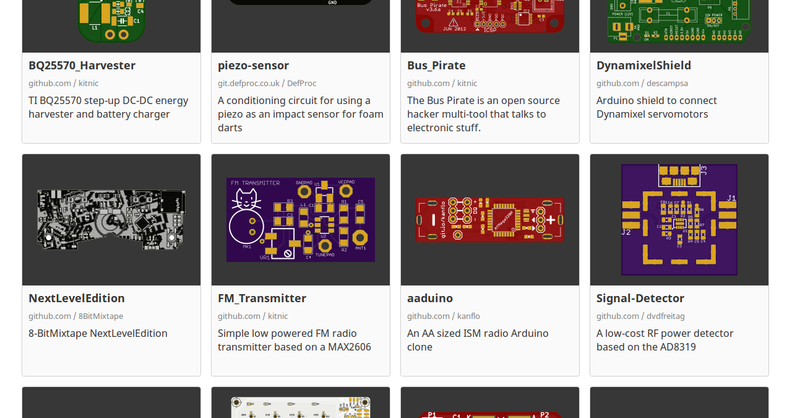 In an effort to encourage people to give it a go, I often look over open source hardware projects that I come across to see if I can get them into a state that is ready to be put up on the site. The challenge is almost always in sorting out the bill of materials (BOM). Really, this is the issue that Kitnic is trying to address: there is no standard way to record a BOM. Whether you are looking at someone else’s project or your own work months after it’s creation, trying to find the right parts can be a tedious exercise. The main culprits are often generic components, like resistors and capacitors, where you care about the basic values and specification but not about the exact manufacturer or retailer part. The 1-click BOM browser extension that goes along with Kitnic makes the process of adding items to shopping carts a seamless experience. In its first few iterations, this only worked if you specified exact retailer or manufacturer part numbers. In an effort to reduce the tedium of creating BOMs I added a smart, semantic match of surface mount resistors and capacitors to those in the Common Parts Library (CPL). This was only possible thanks to Octopart providing the CPL data in an easily parse-able format with a Creative Commons license. The result is best illustrated with the GIF below and should save many engineers a lot of frustration and time. Everything mentioned here is free and open source, and is available on GitHub so if you spot any issues or have ideas for new features don’t hesitate to get in touch — and maybe even dig in and make improvements yourself. We are also currently running a promotion for Kitnic for early adopters: you get free PCB manufacturing for registering your project.